What Is The Lotus Position? 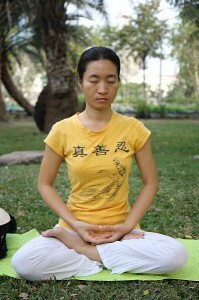 The Lotus position is perhaps the best known of the meditation positions. As well as traditional forms of meditation, the Lotus position is also used in yoga which itself is a physical form of meditation. The Lotus position helps to encourage proper breathing and posture. Begin by seating yourself on the floor (preferably with a mat underneath you) or on a firm mattress. Take your left foot and place it on your right thigh. Take your right foot and place it on your left thigh. Allow your knees to make contact with the ground and centre your torso over your hips. Move your shoulders back and rest your hands on your knees. It does take a certain amount of flexibility to get yourself into the Lotus position. If you have bad knees then the Lotus position is probably not for you. Instead you could try the Half Lotus where only one foot is rested on you thigh and the other foot is placed underneath the alternate knee. If you cannot manage this then you could simply lie down on your back, perhaps on top of your bed, or sit upright in a comfortable chair. Below you will find a video guide on how to get into the lotus position correctly.